BubbleStarz iPhone Game Review: Bubble Popping Fun! 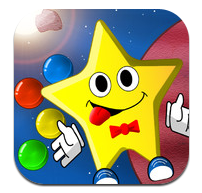 BubbleStarz is an iPhone game developed by Gamicks Inc. This bubble-popping game has an intergalactic flavor, packed with tons of interesting twists to keep things interesting. BubbleStarz takes place in a far away, bubble-filled galaxy where evil emperors rule. 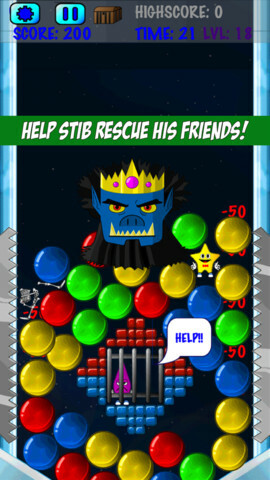 As the player, your goal is to help Stib the Star rescue his friends from Crazoor the evil emperor. At your disposal are some basic skills: popping bubbles, smashing rocks, digging & cutting your way through obstacles. Your goal is pretty simple: pop bubbles in the way of Stib the Star so he can reach the exit. However, some bubbles can’t be popped. For example, pop a slime bubble, and you’ll have to start the level all over again. There are also “stingers,” which sneak up behind you, popping bubbles and deducting points from your score. You’ll have to possess speedy fingers as well: each level is timed, meaning you have to strategize quickly in order to complete the level in time. But not all levels make you pop bubbles: you’ll also need to burrow through barriers, destroy crates, and avoid enemies. There’s a great variety of gameplay, and it’s hard to get bored with the game as a whole when the levels are so diverse. 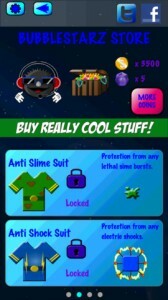 As you collect coins in each level, you can buy items in the BubbleStarz store that will protect Stib. 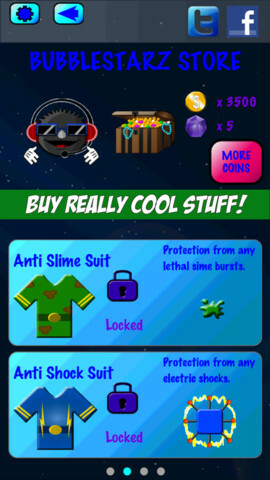 Items include anti-slime and anti-shock suits, for example. 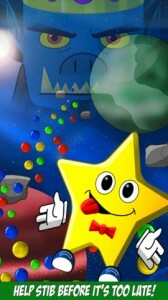 If you like bubble popping games, but find they get tedious after a while, try BubbleStarz. There’s a diverse collection of levels, goals, and tactics players need to master…and that makes it fun! 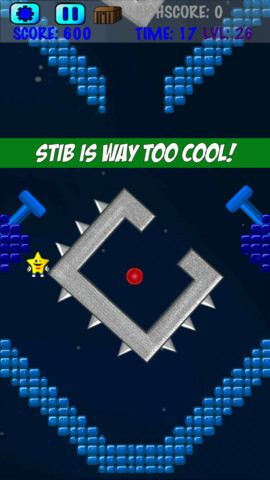 BubbleStarzis compatible with iPhone, iPod touch, and iPad. Requires iOS 5.0 or later. This app is optimized for iPhone 5.